With a small child airports can be difficult to navigate. Everything around you stimulates them and stopping “to look” almost requires an extra hour of travel time. So when my daughters both showed great interest in the Trunki I had a feeling our transit time across airports had gained momentum. I’m sure “Trixie” (she’s the girl Trunki, the boy is Terrance) wasn’t meant to be a ride-on toy but my girls can’t stay away from her! They play “travel” at home and she has added to the great fun! 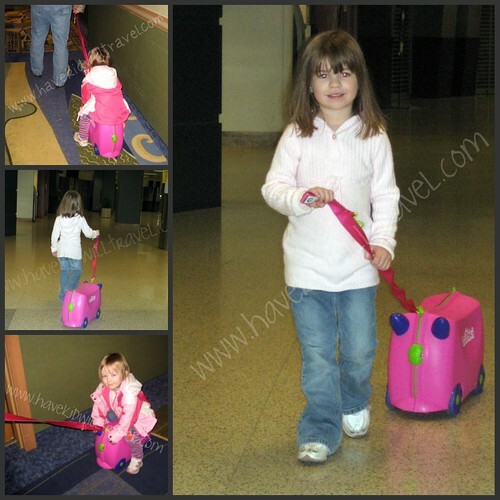 With her bright pink color and “horn” handles she’s much more fun than a regular suitcase. She’s sturdy, has side latches that are secure and a handle that allows you to pull her behind you or tote her over your shoulder. She’s easy to pack and has two very tiny “hidden” spots for treats or treasure. 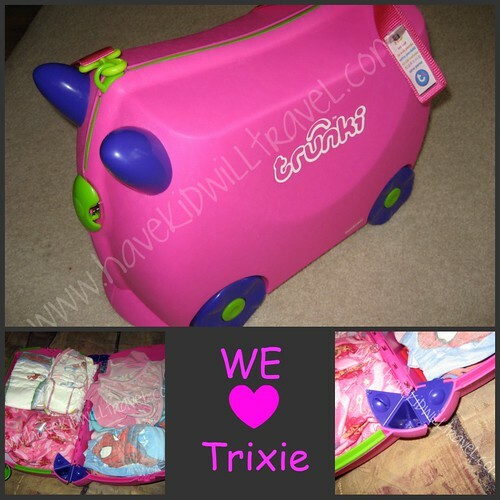 Trixie fit in the both the overhead luggage compartments and under the economy seats on our flights. She’s not really handy to get into during a flight, but it can be done. But where Trunki shines is through the airport (or hotel hallways). Both my girls loved riding her. And we got lots of smiles and comments as we rolled along. The girls both enjoyed riding so much that they didn’t have to stop and look at every little thing. It’s also very easy to pull, even for kids. 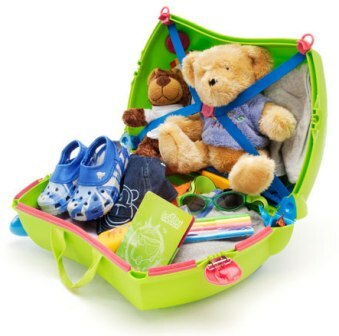 One tip- shorten the strap, it makes Trunki easier to maneuver and keeps you from getting in the way of other travelers. 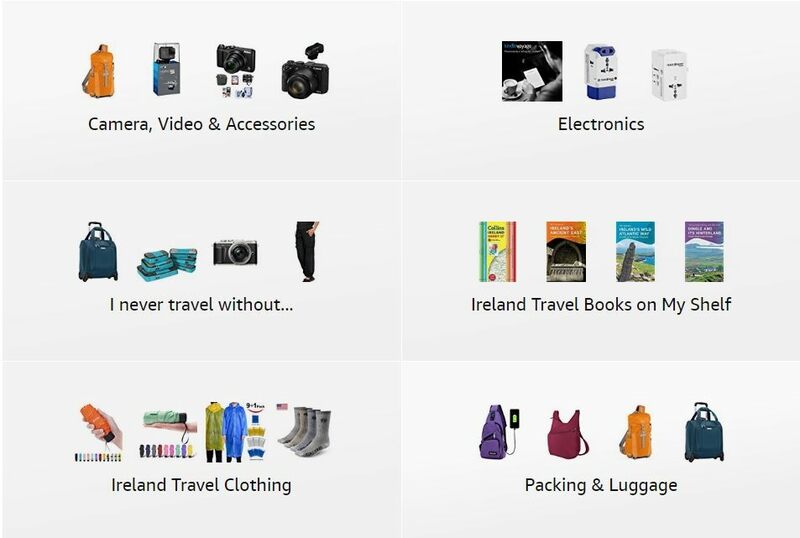 It definitely made our travels easier and more fun! Weight is only 3.55 lbs. As I mentioned, Trixie has a “brother”, Terrence. He’s just the same but blue with green trim. There is also a new addition to the Trunki family, the Deluxe. NEW Key Fixed to strap so it never gets lost. We will be investing in a “sibling” for Trixie before our next travel adventure. 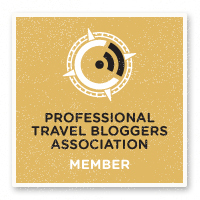 This is definitely a dream come true if you travel with kids! The original Trunki sells for $34.95 and Trunki Deluxe for $44.95.